Did you have a good weekend? I did! We celebrated Sinterklaas with my parents on Saturday with some nice food and gifts! My sister drew my name and she got me some nailart brushes, dotting tools and one of the Models own mirrorball polishes! So expect some manicures with those goodies in a while. This week I have got some chilly nailart for you. We had our first snow this weekend and today it is sticking a bit, so I thought this would fit nicely. For this manicure I used 3 thin coats of OPI - Teal the cows come home (such a strange name, it's not even close to teal?) 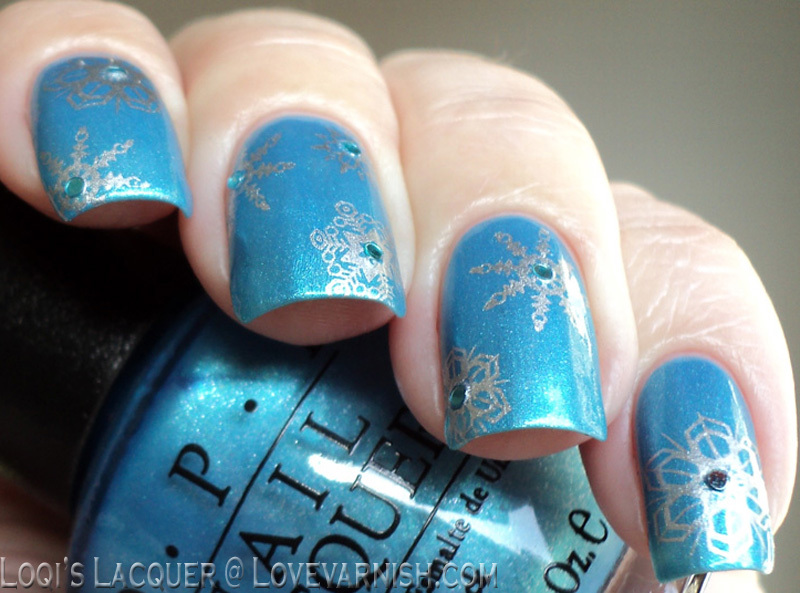 stamped with China glaze - Millennium and the snowflakes from BM plates 14, 319 and 323. Then I put some large blue glitters in the centre of all the flakes. I really like how this manicure turned out, but I am not sure if I am happy with the snow though. I like snow, I just hate going trough it! What about you guys? Oooh, I LOVE this! Love the different snowflake stamps! This is just lovely!! I love the glitter you added to the middle of the snowflakes! This is elegant and gorgeous! :) Perfect for winter! This would be a perfect way to use a light blue polish I own and don't appreciate on its own.